Traverse City is well-known for two unique hobbies -- cycling and craft beer. We have a vibrant cycling community here, and our weekly rides routinely end at a local craft brewery where we swap stories about the ride. But if you think we retreat to our couches when the snowﬂakes start to fall, you’d be very much mistaken. In fact, when the temperatures drop, the adventures into the woods take on a more social and leisurely vibe. With the invention of the fat bike, we get to extend our riding (and beer drinking) seasons right through the winter months. 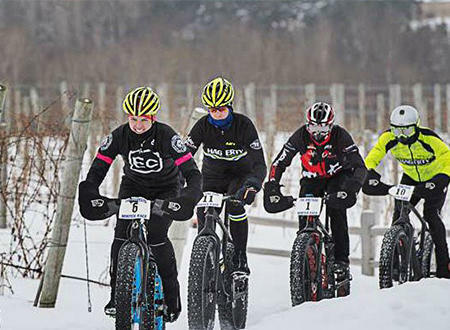 We’re fortunate to have so many incredible winter fat biking trails in Northern Michigan, and equally as important, a vast selection of incredible craft breweries to check out when the ride is over. 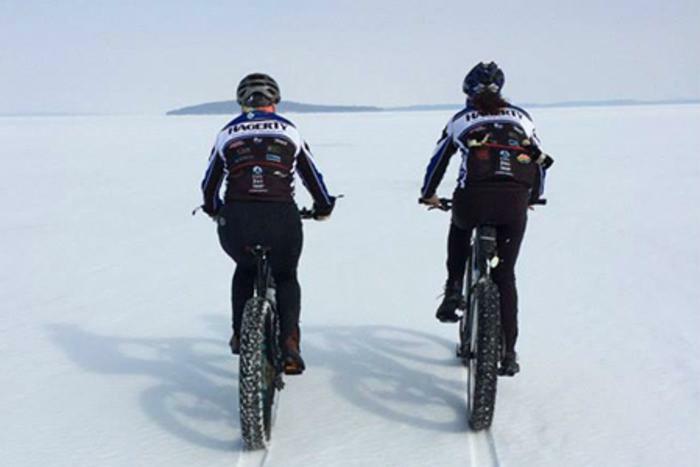 Here are just a few places to visit on your Traverse City fat biking adventures! Glacial Hills, located in the sleepy hamlet of Bellaire, is quickly becoming the premier fat biking trail in Northern Michigan. Expertly groomed by a small army of dedicated volunteers, Glacial Hills is home to miles upon miles of singletrack. The elevation change isn’t overwhelming, so no matter what your ﬁtness level is, you’ll leave the woods the same way you went in -- with a huge smile on your face. And the best part? This nirvana of fat biking is just a forty-minute drive from Traverse City. When you think of Bellaire, you have to think of Short’s Brewing Co. Short’s has played a huge role in the development of the Glacial Hills Pathway, and we owe them a lot for bringing winter fat biking to the area. Their brewpub in Bellaire is the perfect post-ride stop, where you can warm up and drink delicious and eclectic craft brews. Their seasonal Pan Galactic Gargle Blaster is a particular favorite of mine. Built on old railroad tracks, the Leelanau Trail connects Traverse City to Suttons Bay year-round. 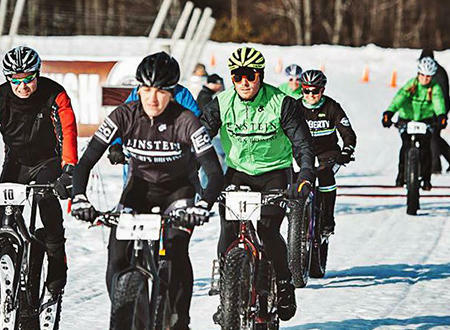 The 17-mile trip is accessible for the vast majority of the winter months, with TART (Traverse Area Recreational Trails) volunteers spending countless hours making sure the trail is ready for fat bikers, skiers, snowshoers and other winter adventurers. When you arrive in Suttons Bay, you can reward yourself with a bite to eat at your choice of local eateries. Hop Lot Brewing is an excellent microbrewery that is certainly worth a visit, while 9 Bean Rows is one of the best farm-to-table restaurants in the state. You also aren’t too far away from 45 North Vineyard & Winery, which maintains a fat bike loop all winter long. The VASA is famous around the state as a mecca of winter sport. With miles and miles of groomed trails, your energy will run out long before the trails do. It’s one of my favorite places to connect with friends for a night ride, which makes fat biking even more fun and adventurous. There’s even a warming hut at the trailhead on Barlett Road for a place to meet up before and after the ride. The best part? The VASA is just a ten-minute drive from downtown Traverse City and its myriad of delicious restaurants and craft breweries. I’m a huge fan of Taproot Cider House, which boasts one of the best drink menus in town! Rare Bird is one of my favorite microbreweries in the area, with the perfect vibe for a post-ride get-together -- and if you still have the energy after a day on the trails, The Workshop Brewing Company usually has some killer live music to complement their impressive beer lineup. If you’re interested in giving fat biking a shot you should first consider renting bikes. They are affordable to rent for the day and places like Einstein Cycles in Traverse City and Suttons Bay Bikes in Suttons Bay have extremely reasonable rates. Don’t let the snow deter you from getting outside and on the trails this winter. Dress warm, wear a helmet, and start your winter fat biking adventure soon. I’ll see you out on the trails! Wes Sovis is the writer of the blog A Chubby Cyclist and teaches indoor cycling classes at Yen Yoga & Fitness. When he’s not racing bikes for Einstein Cycles-Short’s Brewing Co., he’s the Director of Marketing at Swell Development, a web development company.